Are you expecting a new baby in the coming year? Planning a nursery that will be perfect for your little one is fun and exciting. If you’re on a tight budget, like most young families, you should consider buying well-built, high-quality furniture that will grow with your baby and withstand the demands of an energetic, active toddler. (Or maybe a second and third baby as well.) As one of the premier furniture stores in Maryland, Showman Furniture has a great selection of cribs and other nursery furnishings that will accommodate your child’s different needs during his/her first few years. When visitors come to admire your little newcomer, the first thing they’re likely to notice after your baby is the crib she/he is sleeping in. So when you’re planning the nursery, make sure that the crib is a good fit with whatever theme you chose. For example, the white Enchantment crib by Legacy Classic Furniture that we carry would look wonderful in a princess or fairy tale-themed room, but there are probably better choices if you have your heart set on a jungle theme or cars and trucks if you know you’re having a boy. Cribs sold today should all meet the Consumer Product Safety Commission’s requirements, but it can’t hurt to take your own checklist along when you’re shopping. Make sure that the space between slats is no more than 2 3/8 inches, which will prevent your baby’s head from becoming entrapped. Corner posts should be flush with the top of the headboard and/or over 16 inches high (as with a canopy crib) so that the baby’s clothing won’t get stuck on the posts. Don’t expect a drop-down side rail. 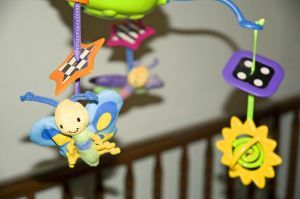 Due to safety concerns, the CPSC banned the manufacture and sale of cribs with adjustable rails after June 2011. Even if you like sleeping on a soft mattress, purchase the hardest one available for your infant. Experts recommend firm mattresses as one means of helping to prevent SIDS (sudden infant death syndrome). Position the baby’s crib away from the windows to avoid the child getting entangled in a dangling curtain or blind cords. When your baby’s a few months old you may get the feeling that you’ll be changing diapers forever. Don’t worry – the time will go faster than you think. So when you’re shopping for a place to change your baby’s diapers, think about how the furniture that you buy today will fit in your child’s room in a few years. You may be able to buy a low dresser, for example, with a top changing table piece that you can eventually remove. For now, look for a changing table that is a comfortable height for you to work with. It should provide enough room for you to access essential supplies (like spare diapers and baby wipes). It should be sturdily fastened to the top of the furniture, with a strong safety strap that will help keep your baby in place. Raised sides on the changing table edges will help prevent a wriggling baby from rolling off. Check the changing table’s drawers and shelves. Will they be easy to get into and use in both the immediate future and later? If you’re a first-time parent, it can be hard to predict how you’ll end up using your baby’s nursery. Will it be a room primarily for sleep, or do you want your child to play and read there as well? One nice thing about buying from a reputable Maryland furniture store like Showman Furniture is our furniture collections. The cribs that we sell also coordinate with nightstands, bookcases, dressers and even under bed storage solutions that will allow you to furnish your child’s room over time. Let us help you create a nursery that is not only beautiful but beautifully functional as well.